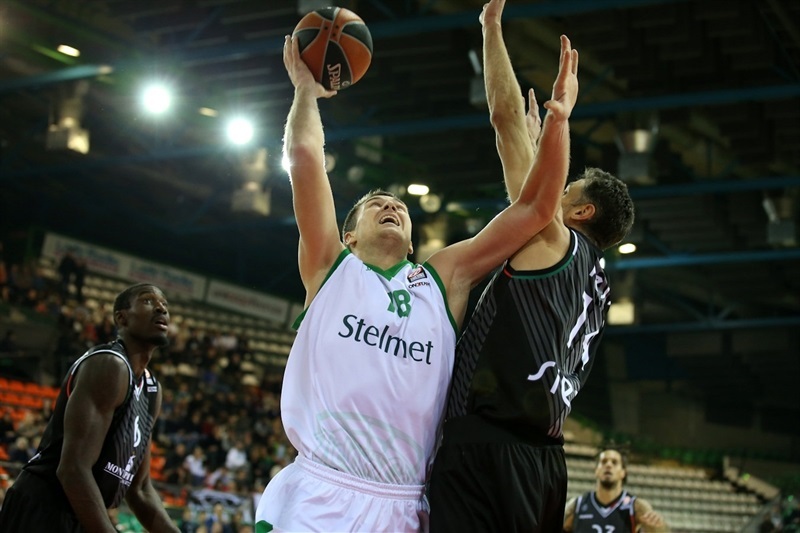 In a thriller that went down to the final second, Montepaschi Siena improved to 3-5 in difficult Group C and improved its chances to make it to the Top 16 by downing Stelmet Zielona Gora 60-59 in Florence, Italy, on Thursday. 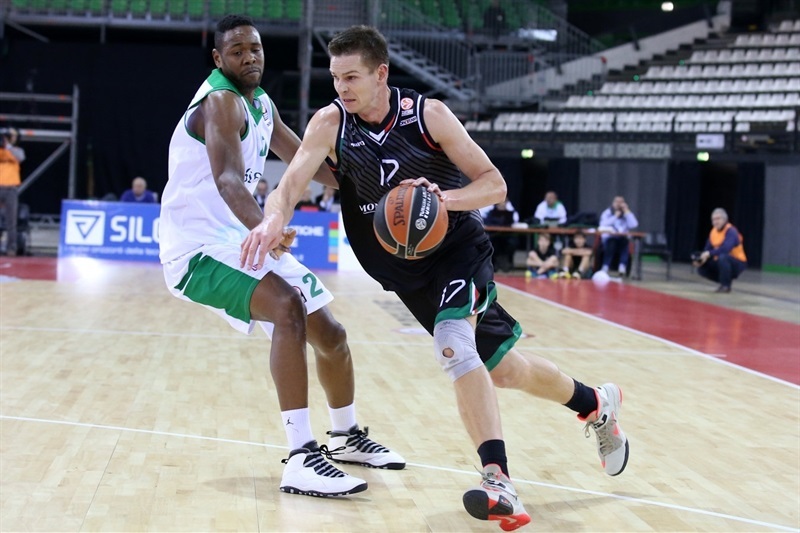 Montepaschi grabbed its third win in four games and dropped Zielona Gora to 2-6. 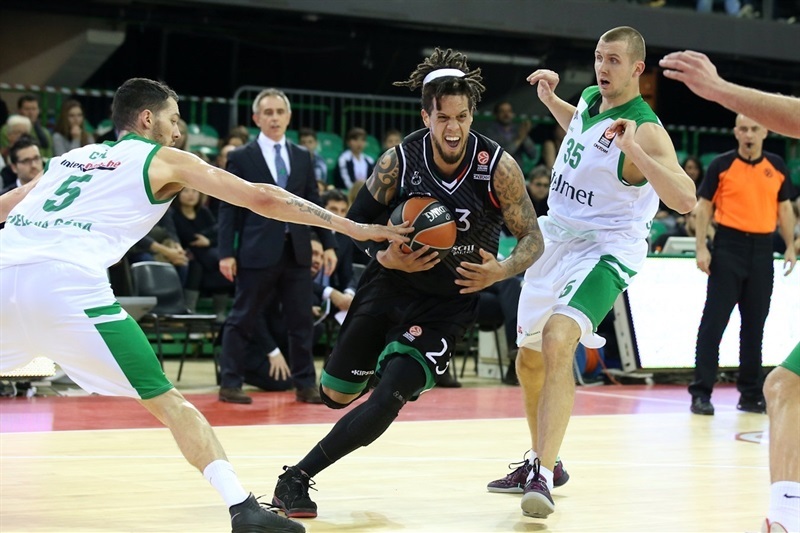 Erick Green paced the winners with 13 points. 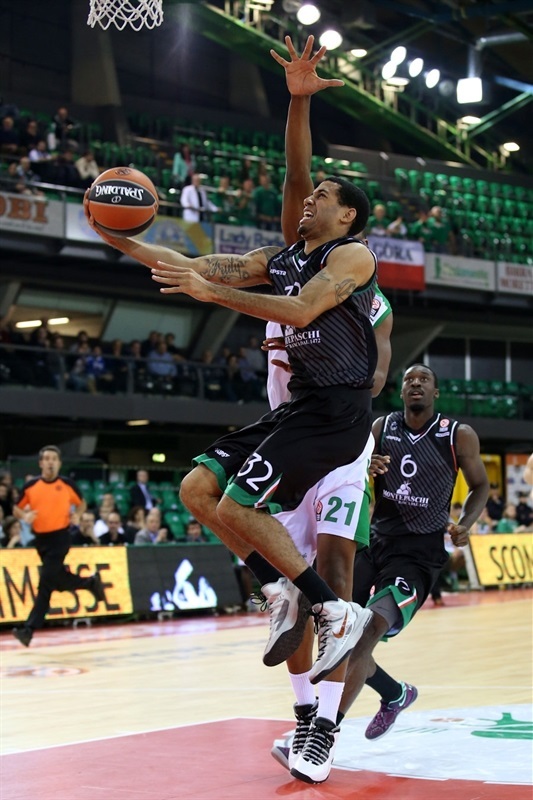 Daniel Hackett added 12 while Josh Carter had 10 for Montepaschi. 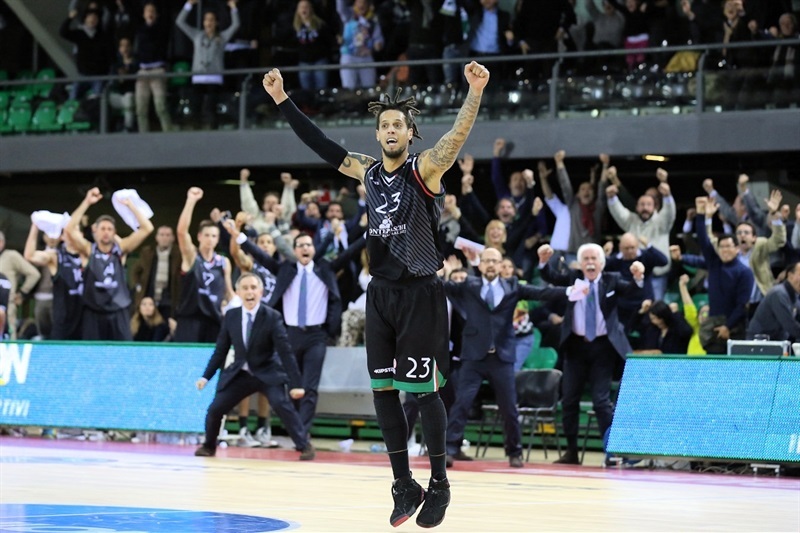 Just as he did against Unicaja Malaga, Jeff Viggiano became Montepaschi's hero with the game-winning three-point shot with 1.1 seconds left. 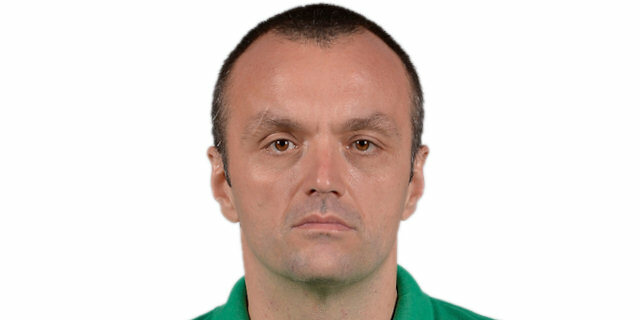 Vladimir Dragicevic led Zielona Gora with 20 points. Christian Eyenga had 16 for the guests. A floating shot by Taylor Rochestie gave Montepaschi an 18-17 lead after 10 minutes. Great defense and an outstanding Kamil Chanas allowed Zielona Gora to get a 24-29 edge, but Hackett singlehandedly brought Montepaschi back to tie the game, 30-30, at halftime. Dragicevic took over after the break and gave Zielona Gora a 47-49 lead. It all came down to the final few minutes. 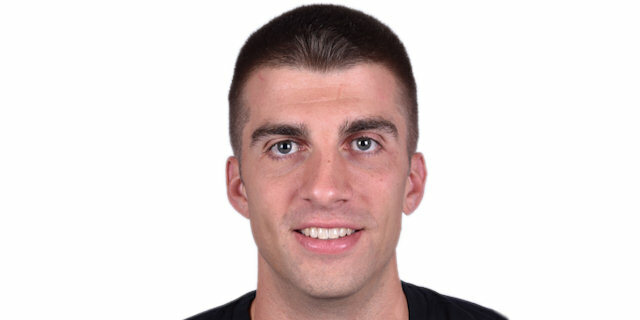 On Montepaschi's final offense, Viggiano downed the game-winning triple in the next-to-last second and Zielona Gora could not shoot in the game's final possession. Carter got Montepaschi going with a three-pointer off the dribble. Eyenga dunked, but Othello Hunter quickly answered with a fadeaway jumper for a 5-2 Montepaschi lead. Hackett fed Carter for a fast break layup that Aaron Cel bettered with a bomb from downtown. A backdoor layup by Dragicevic tied it at 7-7. Hackett shined with a driving layup and a catch-and-shoot triple by Green gave the hosts a 12-7 lead. Eyenga sank a one-handed floater and a tip-in by Cel kept Zielona Gora within 1. Green hit a mid-range shot before Dragicevic scored again and a floating jumper by Przemyslaw Zamojski gave the guests their first lead, 14-15. Green dunked off a steal, but Dragicevic took over with a second-chance layup to restore a slim Zielona Gora edge. Rochestie sank a floating shot to give Montepaschi the lead, 18-17, after 10 minutes. Adam Hrycaniuk scored early in the second quarter, but Viggiano improved on that with a layup-plus-foul. Even so, Montepaschi struggled to organize its offense without Hackett on court. He returned to the floor, but Montepaschi could not get him involved. However Zielona Gora was held scoreless for more than two minutes. The guests could not find open shots until Craig Brackins nailed one from beyond the arc for a 21-22 Zielona Gora lead. Green swished a five-meter jumper, but Kamil Chanas improved on that with a three-pointer. Green split free throws. A wild turnaround jumper by Eyenga boosted his team's lead to 24-27. Chanas took over with a wild driving basket as Zielona Gora was all over the place on defense. Montepaschi found its regular go-to guy in Hackett, who made free throws and added a fast break layup off a steal to bring his team within 28-30. The league leader in fouls drawn, Hackett made got back to the line and more foul shots to tie the game, 30-30, at halftime. Eyenga downed a corner triple immediately after the break and a free throw by Dragicevic gave Zielona Gora a 30-34 lead. 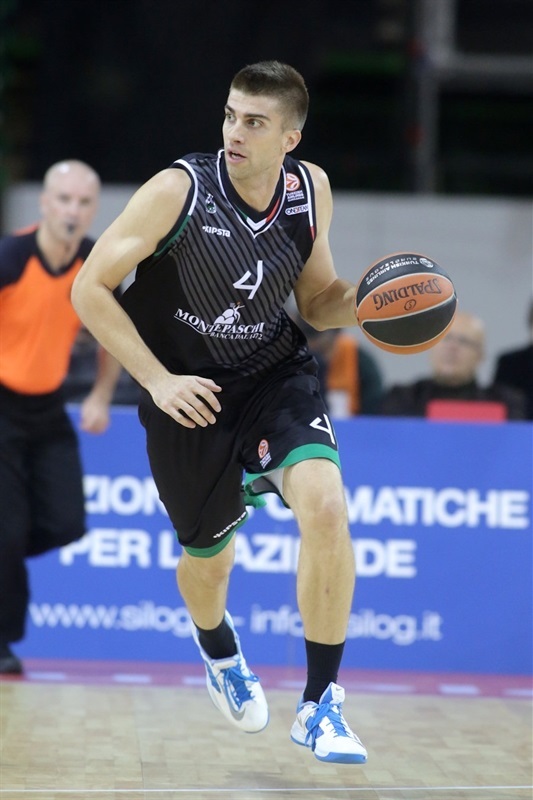 Montepaschi struggled to score for almost two minutes until Tomas Ress took over with a four-point play, which tied it at 34-34. Dragicevic split foul shots and Carter bettered him with a wild, running three-pointer, good for a 37-35 Montepaschi lead. Eyenga and Green traded baskets and Dragicevic kept the guests within 39-38. Othello Hunter made free throws, but Zamojski took over with an acrobatic basket. 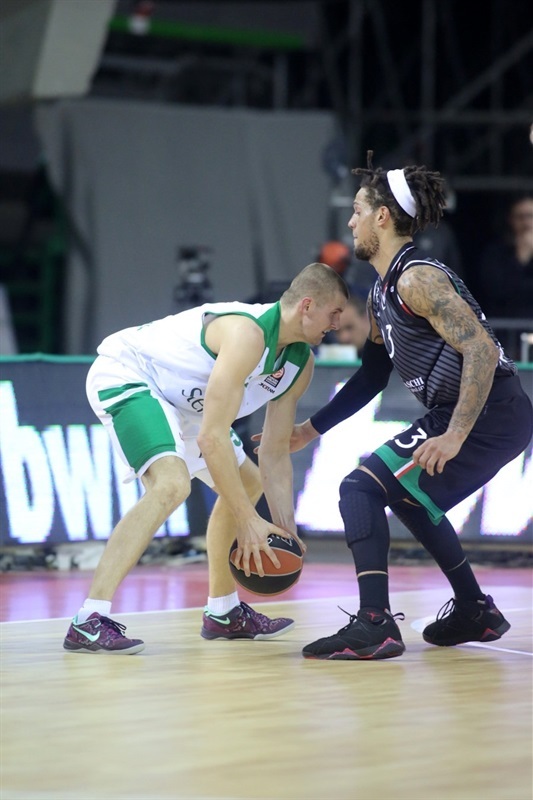 Hackett kept pacing Montepaschi with a driving layup, Dragicevic scored again and a big basket by Lukasz Koszarek put the guests back ahead, 43-44. Dragicevic downed a four-meter jumper before Carter made free throws, but Zielona Gora still led 45-47. Dragicevic dunked off a midcourt steal. Free throws by Hackett kept Montepaschi within 47-49 through three quarters. 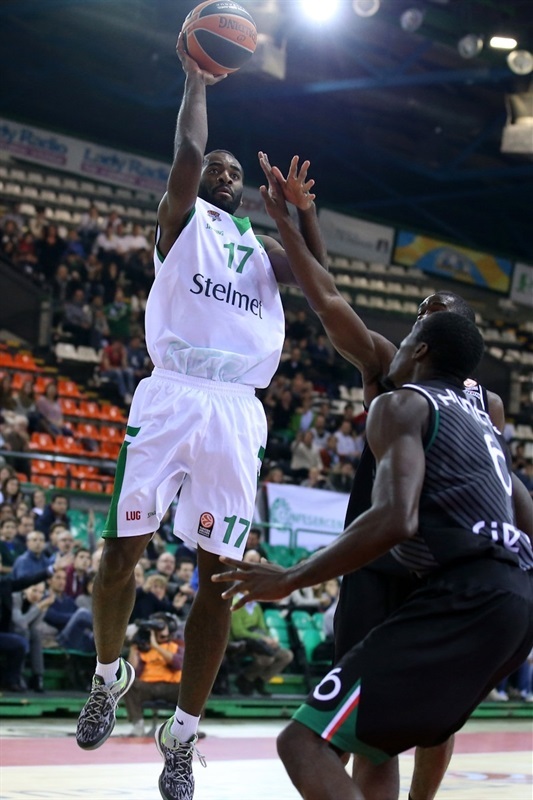 Green nailed a seven-meter bomb early in the fourth quarter, putting Montepaschi back ahead, 50-49. 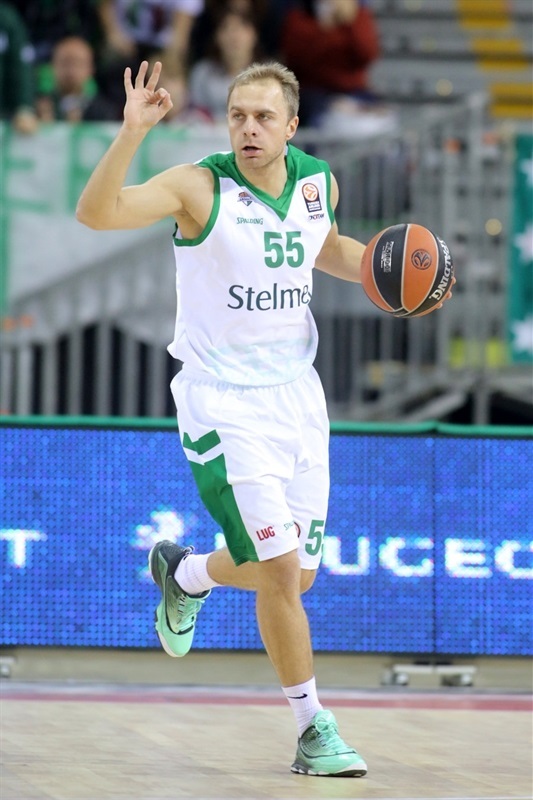 Zielona Gora struggled to score without Dragicevic on court and a layup by Viggiano made it a three-point game. Dragicevic returned to the floor and delivered with a layup that Benjamin Ortner matched at the other end. Rochestie hit a free throw before Dragicevic scored again. A dunk by Brackins tied the game at 55-55 with four minutes to go. Eyenga took over with a fast break layup that forced Montepaschi to call timeout down 2. Montepaschi struggled to find open shots and Eyenga scored again. Zielona Gora kept using long possessions to run the game clock down. A floating layup by Rochestie brought the hosts within 57-59 already in the final minute. Zamojski missed from downtown. Then Viggiano buried the game-winning three-pointer with 1.1 seconds left. Zielona Gora had a final chance to win the game, but could not get a shot up on the game's final possession. "We did not play our best game, but we were always in touch. The team did good not to give up"
"We deserved to win. The game was decided by a few lucky plays that favored Siena. Of course I speak only of this meeting. We should not underestimate the work of Coach Crespi and his staff, but I think that the game was in our hands." "I was lucky to get the ball when the defense collapsed. I took the shot and it went in. We never gave up. It was too important to win tonight "